Today brings us the second half of my newest find! It's so rare for me to find something before Jason... but it happens. 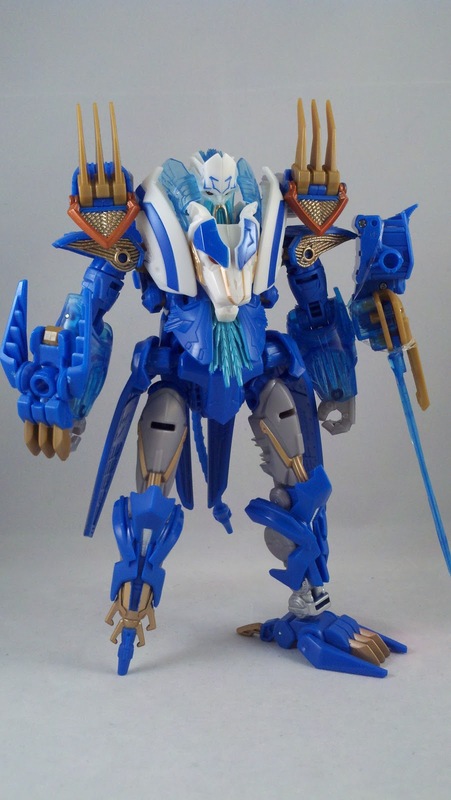 Anywho, Today we're going to look at one of the newest Transformers Prime figures, the all new character from an all new faction the Star Seekers; captain of the Tidal Wave, Thundertron! So who is this heavy metal kitty? Take a look after the jump! Ok... whoa, whoa, whoa... NEW faction? Since when? Since the Alex Irvine penned novella, "Transformers: Exiles". 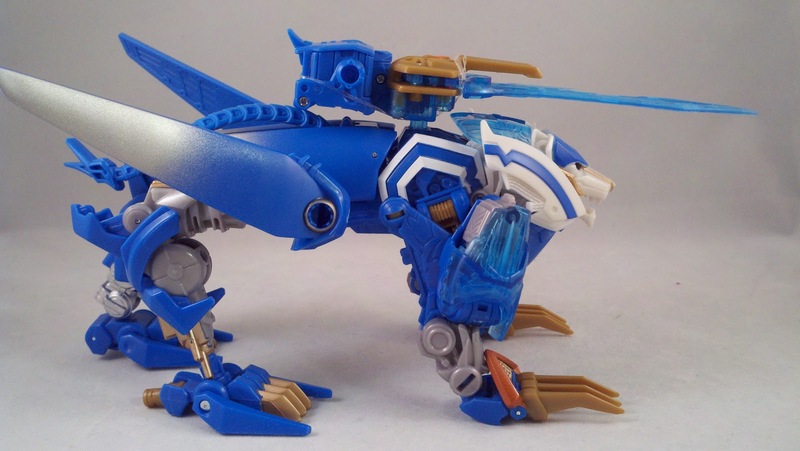 The sequel to Alex Irvine's "Transformers: Exodus". "TF:Exodus" laid out what led up to the Great War... the war that nearly destroyed Cybertron as it birthed the Autobot and Decepticon factions. 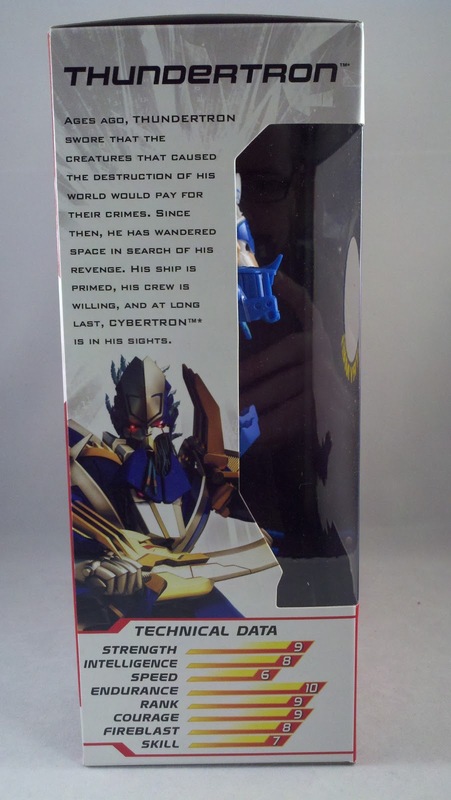 The war that began the legends of Optimus Prime and Megatron. 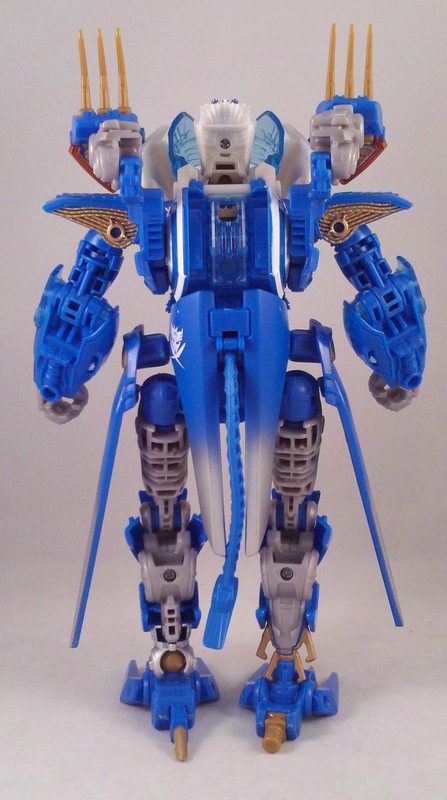 Anyways... Thundertron and crew embark on a whirlwind adventure of piracy, killing Junkions, and having a Space Bridge attached to their ship. Thundertron comes window boxed in the usual TF:Prime formatted white box with red detailing. 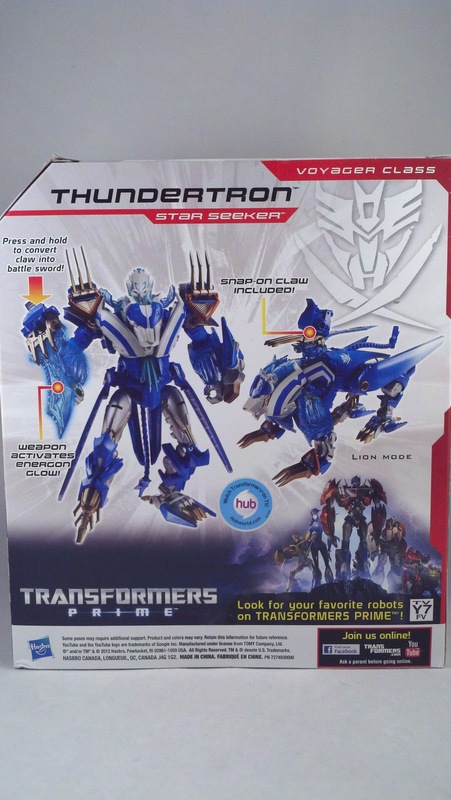 The box front gives us some nice artwork of Thundertron's Alt-mode. 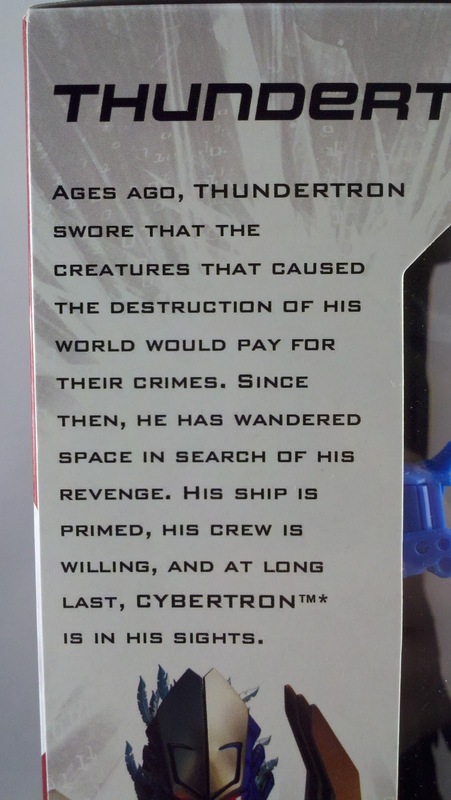 The back shows us both Thundertron's Bot and Alt modes and points out Thundertron's accessories. 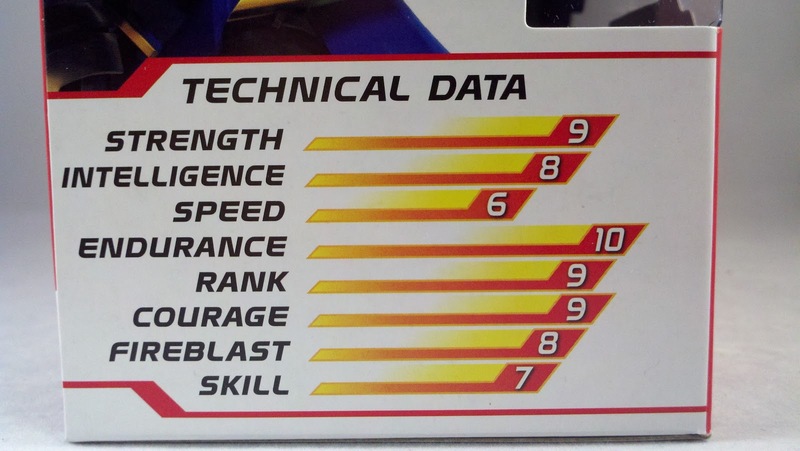 One box side provides us with Thundertron's Tech-Spec and bio. Open the box and we find the normal fare of plastic tray with paper ties, plastic bands and instructions underneath. First Impression out of the package... I kinda like the cut of this bot's jib. His colors are a little on the light side for a pirate... but I'm liking it. 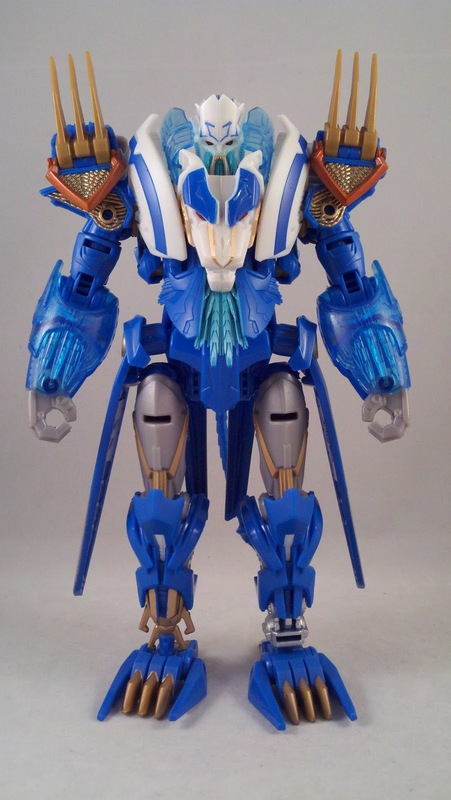 The back piece and the wings on the waist lend to the look of a long coat. He's got a big 'ol piratey beard... and though his weapon is Meh-Tech... it's a HUGE cutlass. 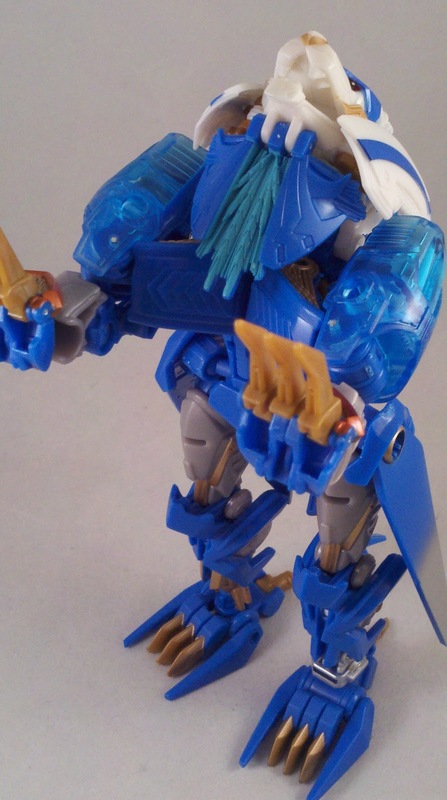 Thundertron is molded in primarily light blue, grey, and white plastic with plenty of gold and silver paint apps. 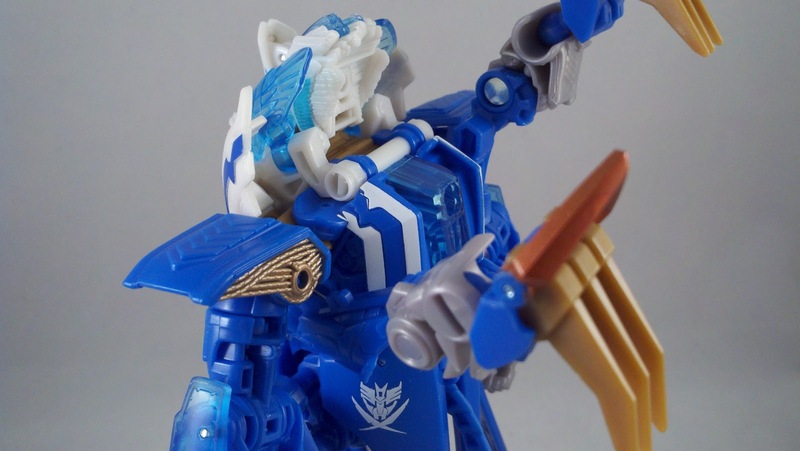 Some translucent blue plastic is used as well to help with his "Energon Glow" gimmick. 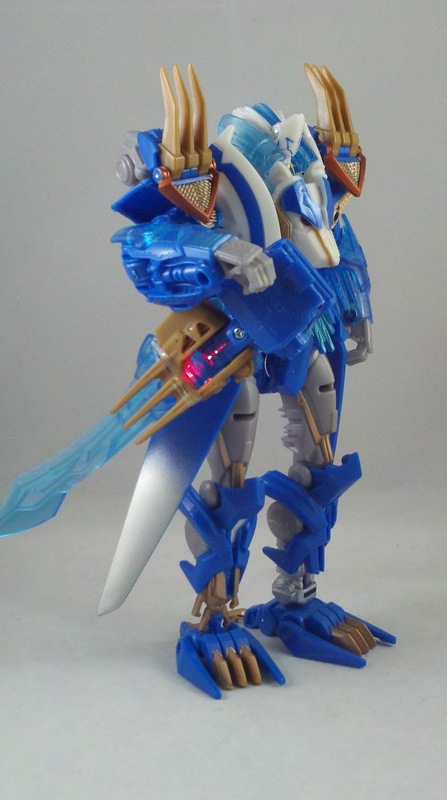 Sadly, the light for the gimmick is in his weapon and not strong enough to really make anything glow. 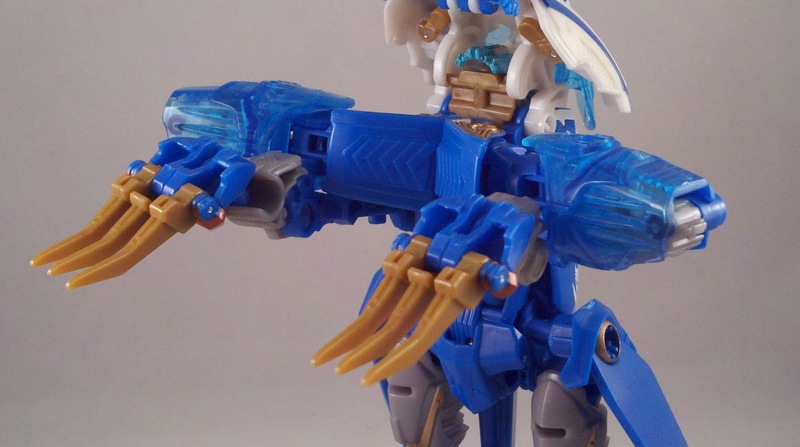 Thundertron's major accessory is of course, his Meh-Tech weapon... his GIANT pirate cutlass. 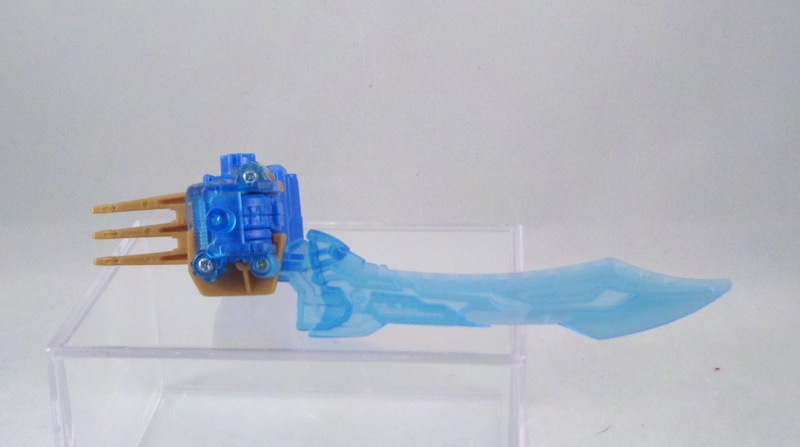 Unlike Ultra Magnus' hammer, the cutlass has no locking mechanism to keep it in weapon mode, so I had to get a little creative. 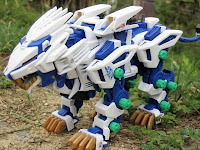 I used one of the packaging's plastic bands to keep it in it's weapon mode. 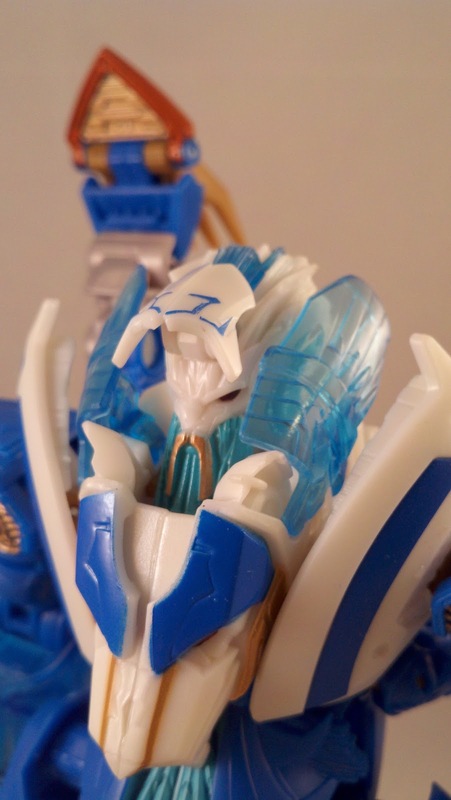 The cutlass can be placed in quite a few areas on Thundertron's person. 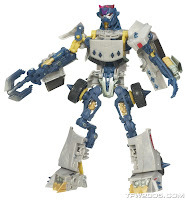 It can be stored on his back in a spot just below his neck (where is goes in Alt-mode) and there are spots on his forearms and at his waist, and of course in hand. 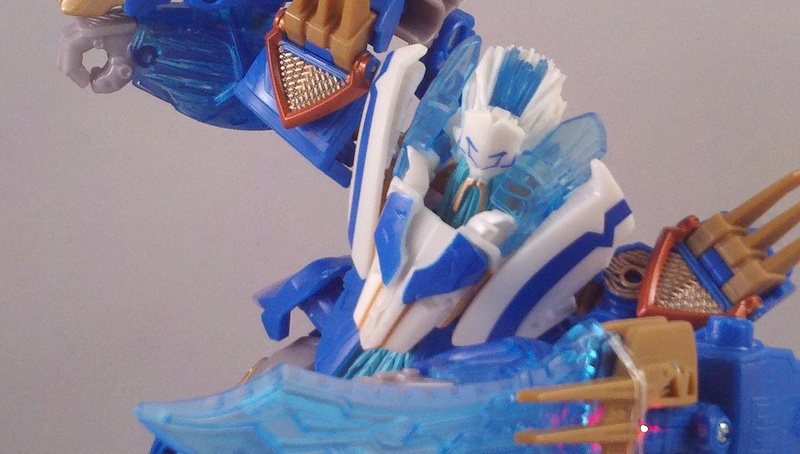 Since he's a pirate, Thundertron has a neat little added bit. Notice that he has two feet? Notice one of those feet is a bit different? 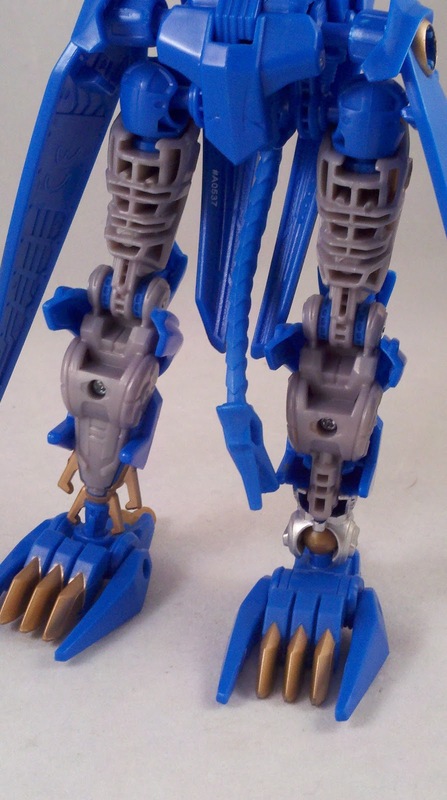 One foot has a claw at the heel that helps balance the figure; the claw gets folded under in Alt-mode. 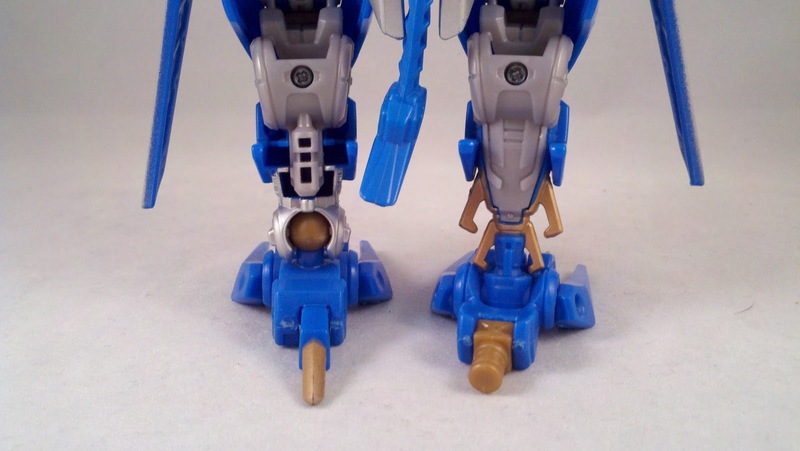 The other foot has a 5mm peg at the back. 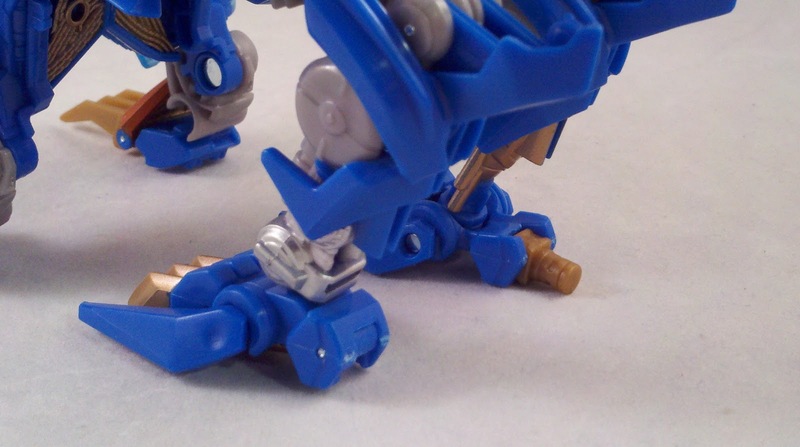 This foot can be detached exposing a peg leg and then used as a weapon... the "Snap-On Claw" mentioned earlier. It's a silly cliche' pirate thing... but for me, it works. 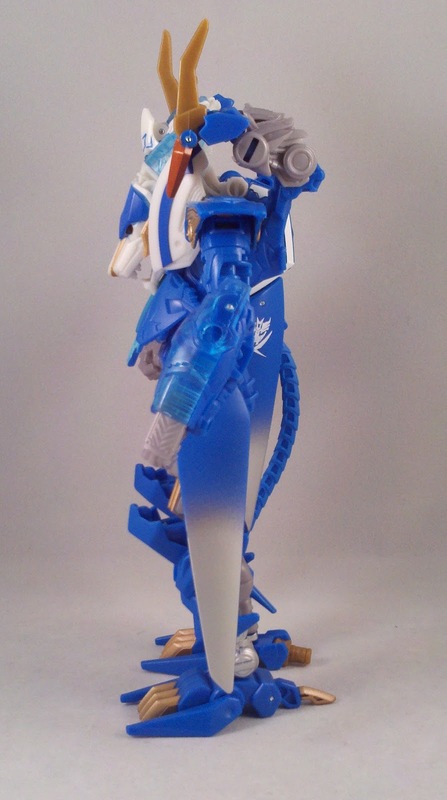 Despite the lack of a foot... Thundertron still has some good poseability. 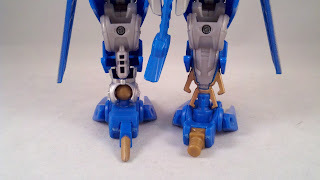 He has plenty of swivel, hinge and ball joints. 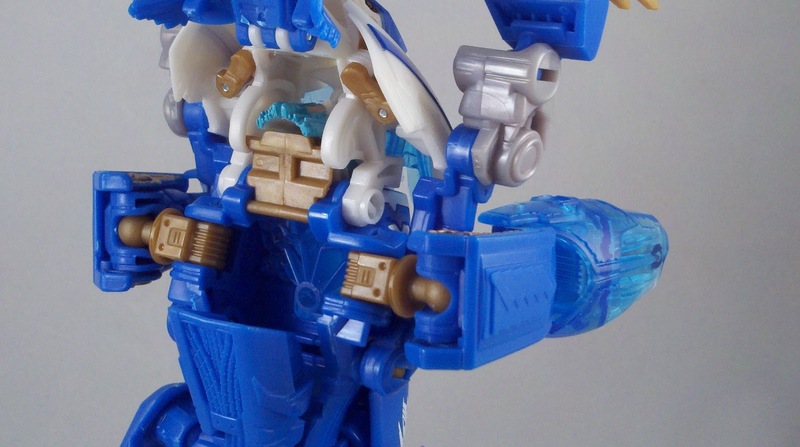 His shoulder pads do hinder the arms a little... and if his cutlass is attached to the forearm, the Meh-Tech battery and spring section add a lot of bulk that gets in the way. 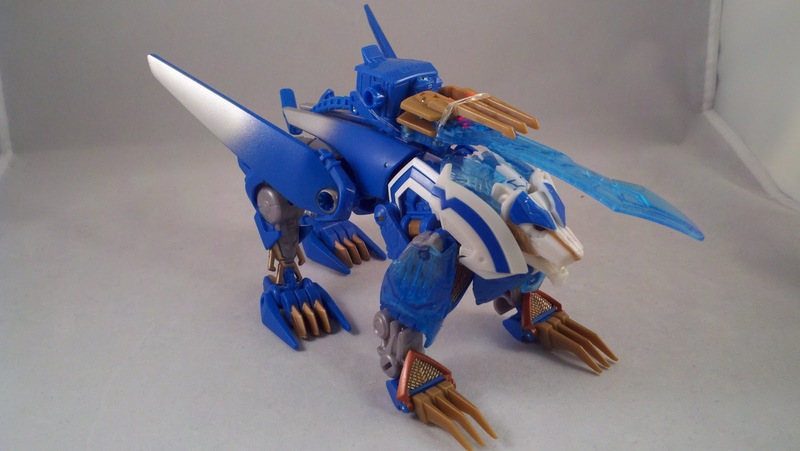 Start by disarming him and placing his Claw weapon back on as a foot. 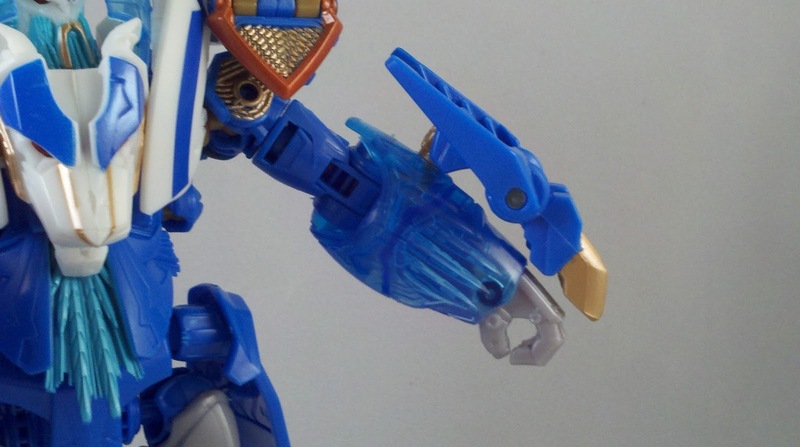 Rotate the forearms so the palms are facing out... swing the arms back and then at the gold joint piece, fold them into the chest cavity. Swing the pieces with the shoulder pads on them down and forward, there is a spot for them to snap into place. 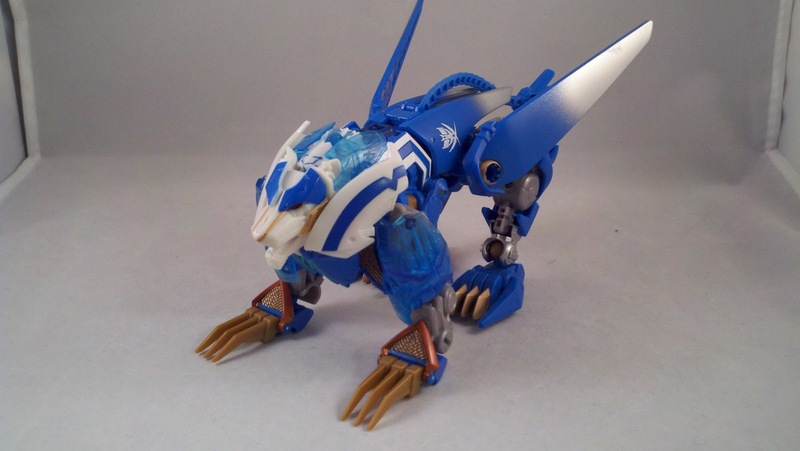 Rotate the pads with the claws around and fold them in a bit, these become the front feet. The arms fold at the elbow backwards towards the body. Fold the lower piece of the mane down. For the legs... pull them outward at the hips. Rotate them 180 at the hip joint and then rotate the feet 180 so they are facing backwards to the legs. Fold the legs 90 degrees at the waist and then again at the knees. 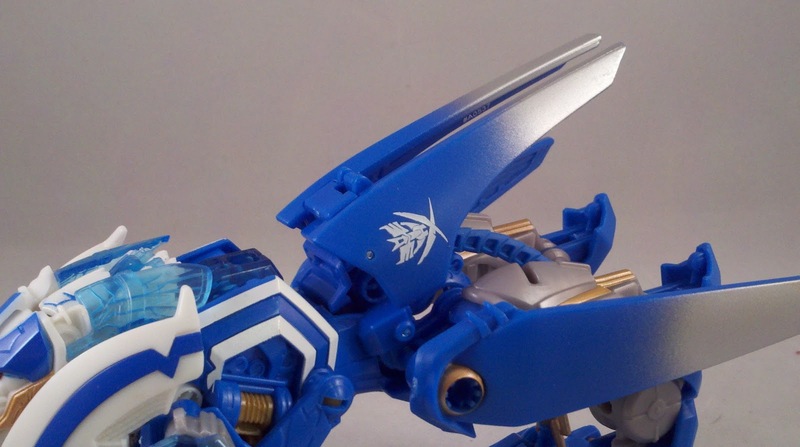 The coat tail piece is pushed in towards the lower back. 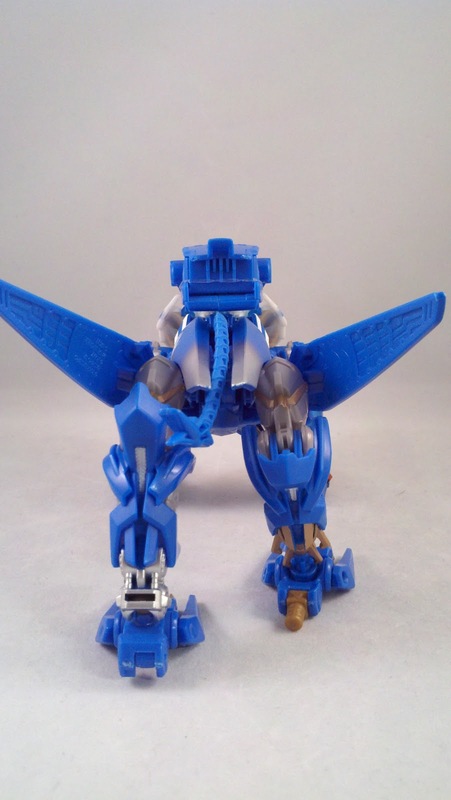 The "wings" can be positioned however you like... I angled them towards the back. On the attached foot, fold the claw underneath. The post on the Snap-On claw cannot be folded in. 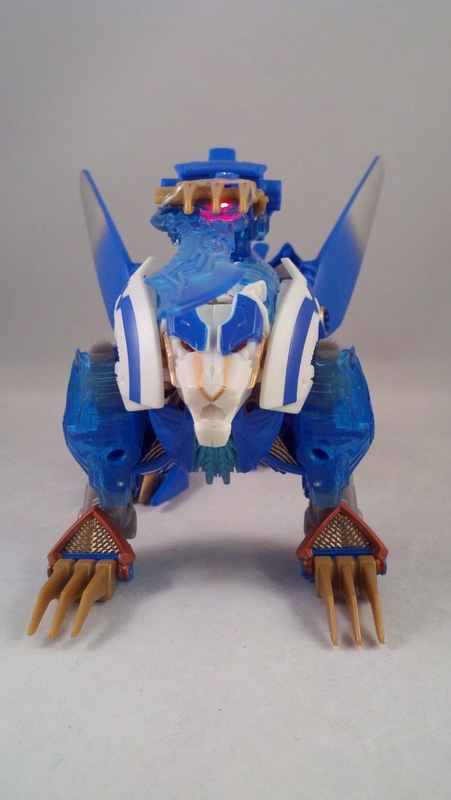 Thundertron's Alt-mode... or should I say Beast-Mode... is one of the first true Beast-Modes we've received in a while... 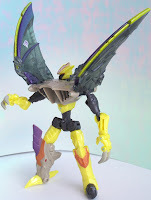 Animated Black Arachnia was the last I believe... 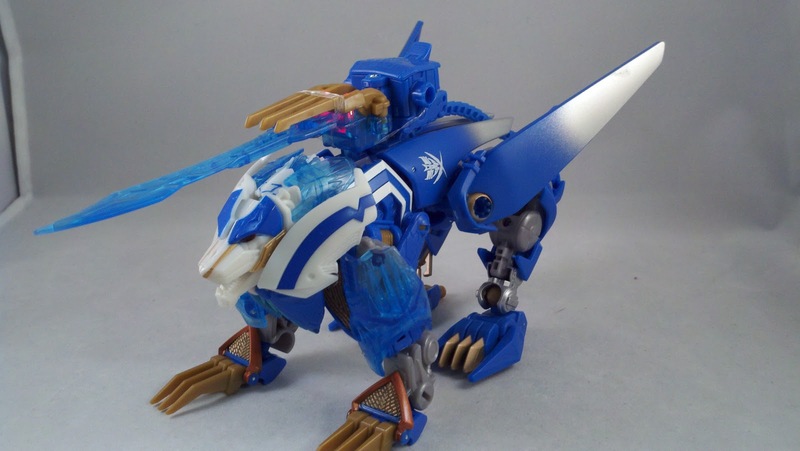 I don't count movie Ravage or Laserbeak as their beast forms are their Bot-modes. 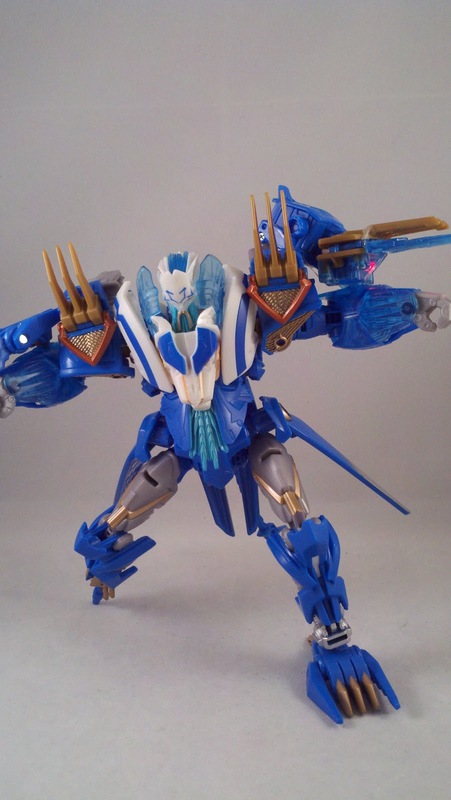 None-the-less... Thundertron's Beast-mode looks good. 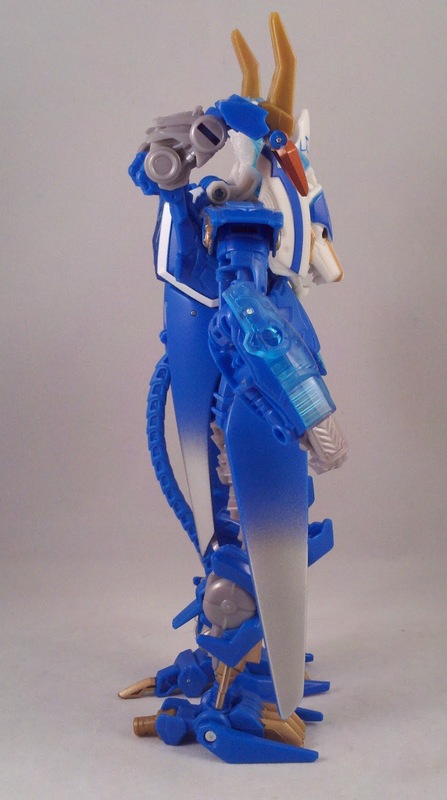 His Meh-tech weapon snaps into place on his back... another take from the Liger Zero. 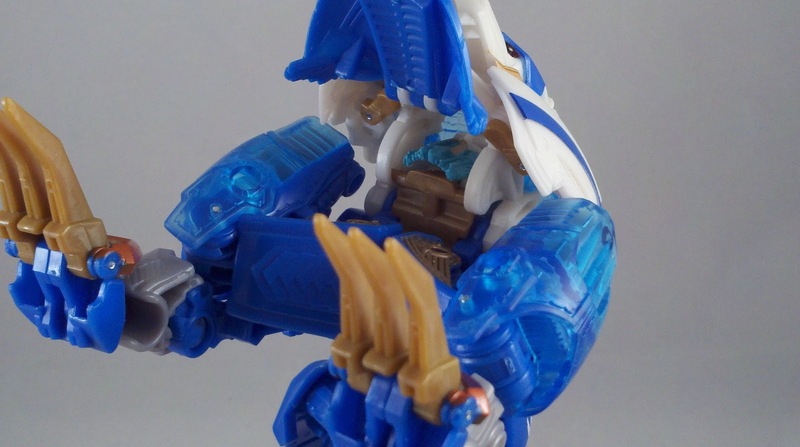 sadly, in Beast-mode, Thundertron's front legs are not very articulated... well... at all. 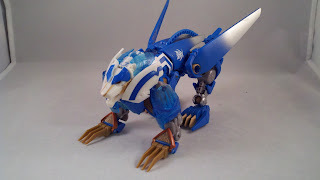 The back legs can be moved fairly well considering the articulation... and that their the Bot-mode legs just twisted around. 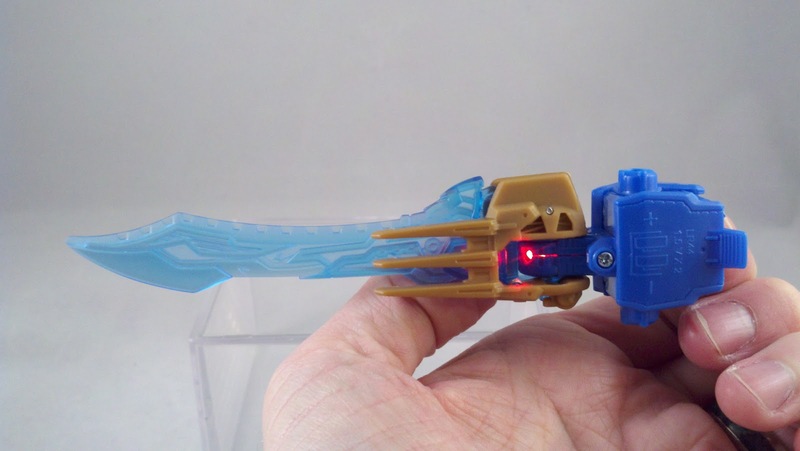 I left the plastic band on the Meh-Tech weapon to keep it extended... I can see Thundertron jumping around slashing enemy Zoids... 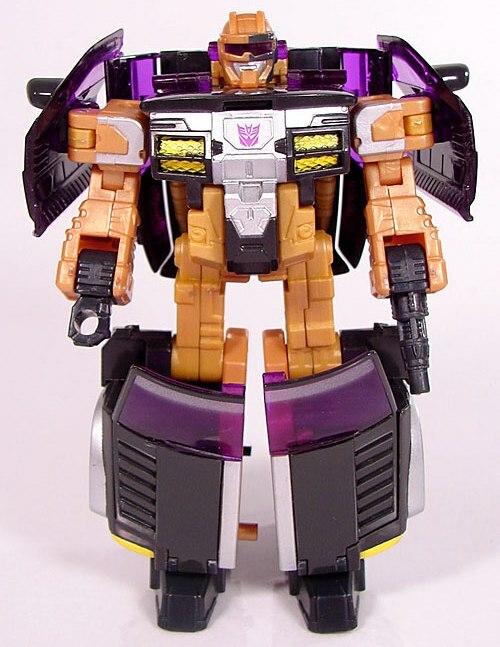 I mean Decepticons in half. 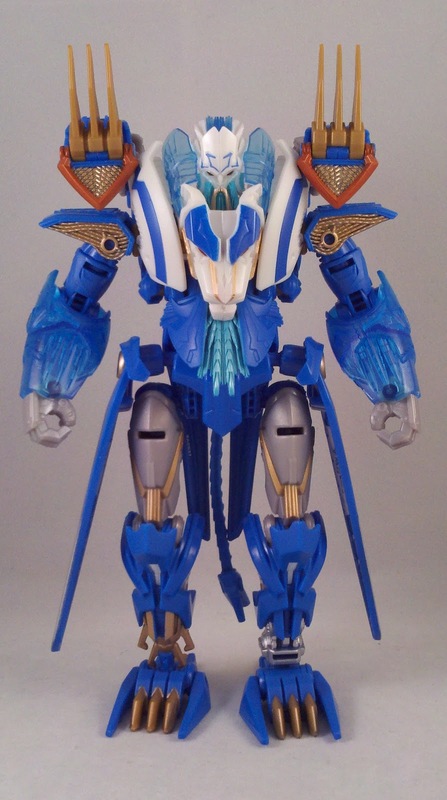 All in all, I like Thundertron. 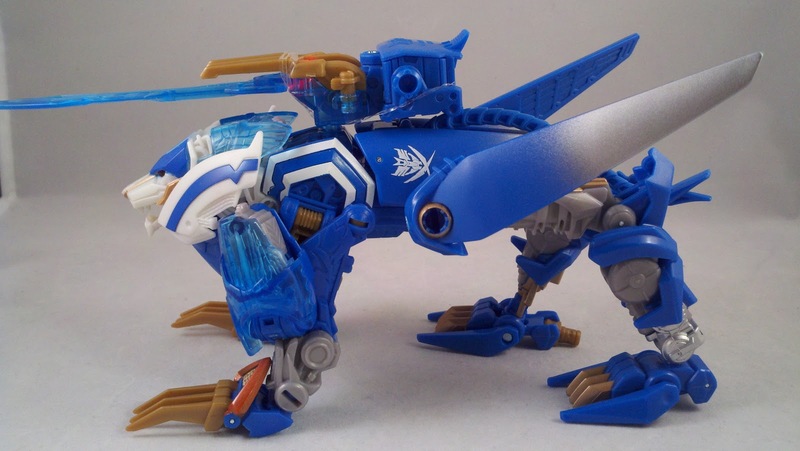 He may be a cliche' of a pirate character but I like his look in both Bot and Beast modes. 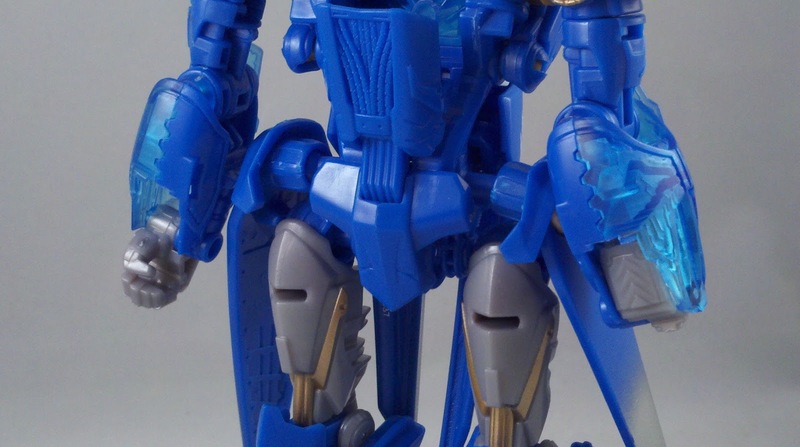 A little more articulation in Beast-mode would have been nice, but his Bot-mode is more than likely what I'll have him in while he's on display. 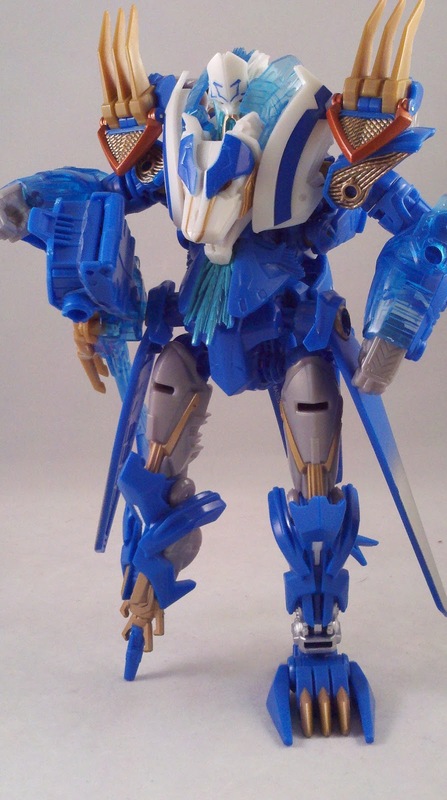 The Star Seekers faction was actually introduced to us at Botcon in 2011 as part of the Hasbro product panel. I know a few of us got a chuckle out of the Jolly Roger-esque logo they showed us. But still, it was interesting to hear about a new faction. 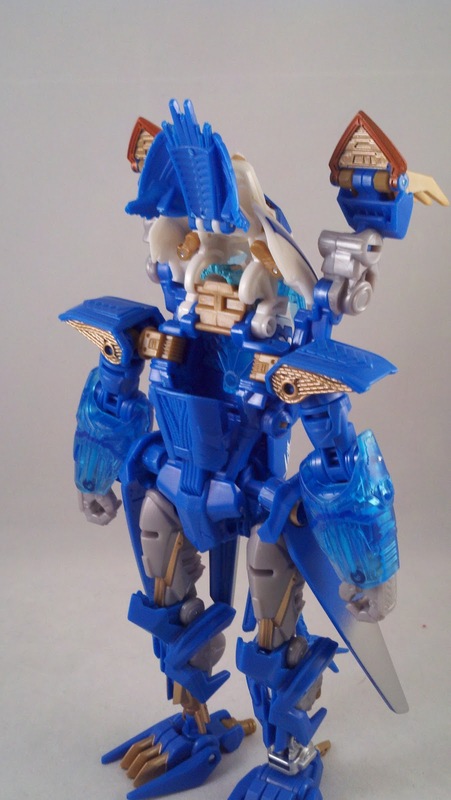 I would love to eventually see more Star Seekers released on the mass market. According to TFWiki.Net... the current roster of Star Seekers is; Thundertron, Brimstone, Cannonball, and Axer. 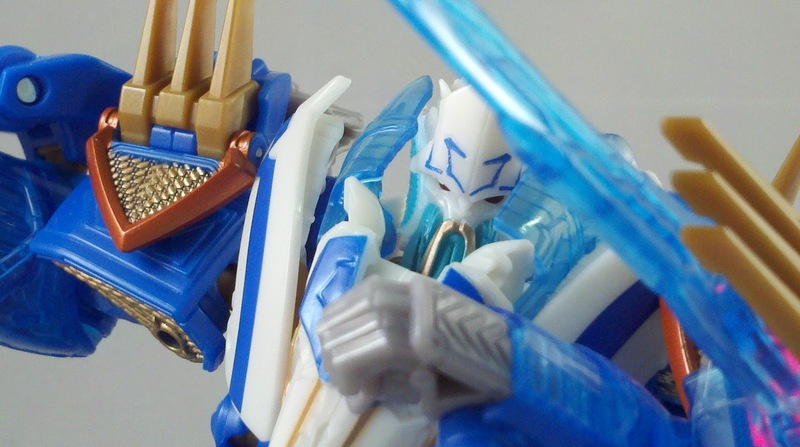 We have an Axer figure... well Axor... he's a repaint of the Revenge of the Fallen Lockdown mold. Cannonball and Brimstone are figures from the Cybertron line; a Red Alert repaint in darker colors and a Jungle Planet Pteradactyl respectively. 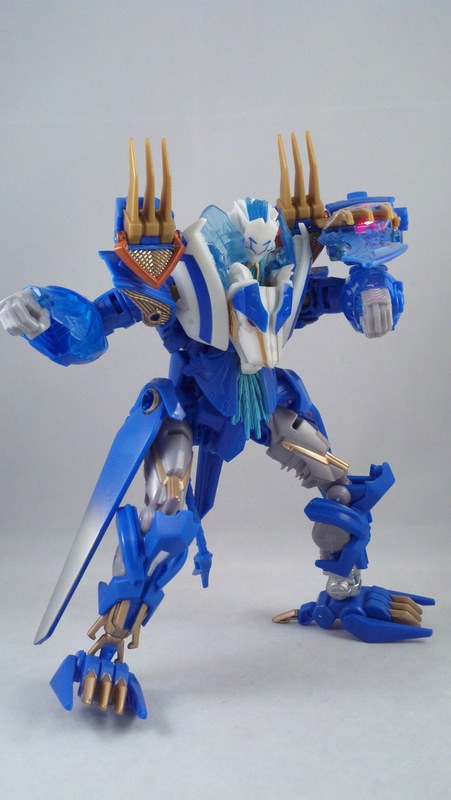 So, the figures are out there if you wanted to make your own Star Seeker crew of the Tidal Wave... 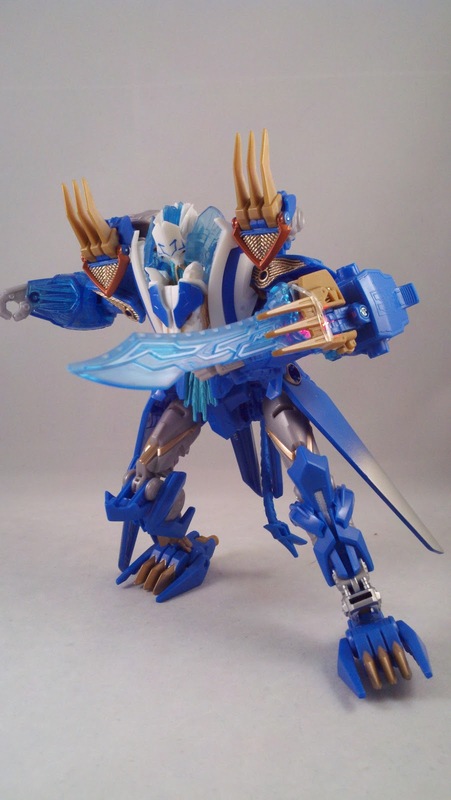 Tidal Wave, oddly enough, is also the name of a character from the Armada and Energon lines. 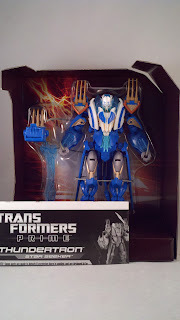 Pics, review, and a Star Seekers life for me by Scion of Primus. 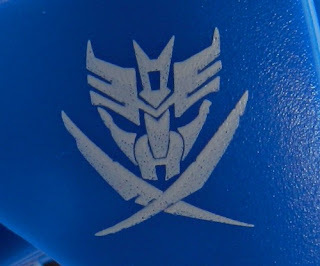 See, I'm going to surprise everyone here and say I think it's awesome and seems odd Hasbro hasn't "looted this booty" before. Pirates? Who doesn't love pirates? Robot Pirates? YES PLEASE! 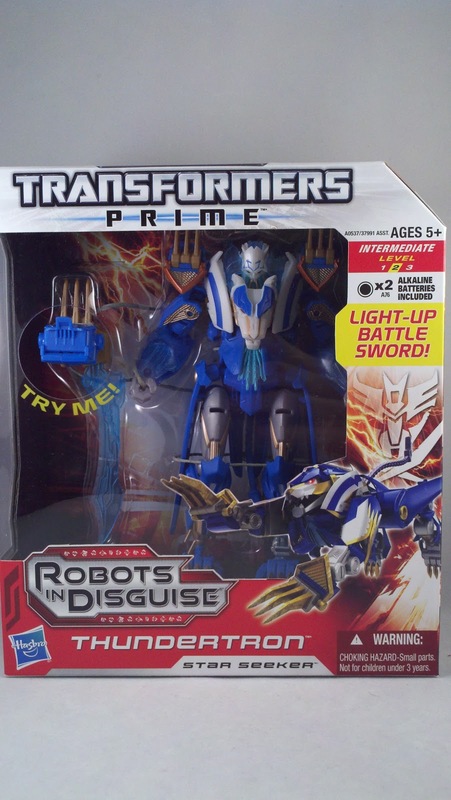 I guess its just, we have so many Transformers that are "ninja-like" these days that it seems a natural follow up to have some Pirates join the ranks.